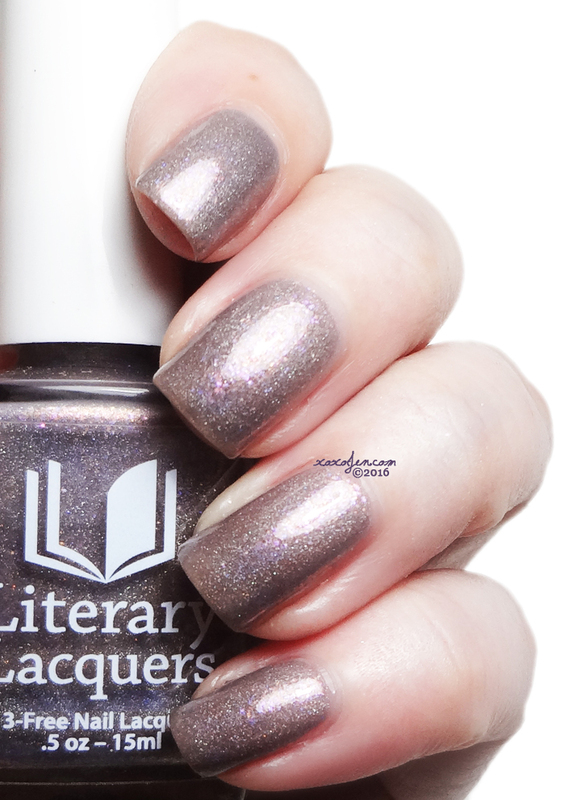 These four new polishes from Literary Lacquers are stunning! A couple of them look very different on varying skin tones and lighting and I'm excited to share them! The Cactus Duo is inspired by a book called The Cactus, by O. Henry. It tells us the story of the pompous, arrogant, broken-hearted Trysdale. The story opens with him upset after watching the woman he loves marry another man. During their courtship, she had heard that he spoke fluent Spanish, he kept quiet and allowed her to assume that it was true. When he proposed to her, she sent her answer the next day. A cactus in a pot bearing a tag with a single word. Ventomarme. Not hearing anything else from her, he decided that the cactus was a refusal of his proposal and he turned cold toward her. Only after attending her wedding to another man, does he find out that ventomarme means come and take me. Ventomarme – designed for Jennifer Sky Walker’s blogiversary, a dusty grey-green-blue with holographic microglitter, silver microflakes, and blue glass flecks. This is a morpher depending on lighting and skin tone. It looks more blue/grey on me, where it leans more green on others. This polish is a sheer crelly so I wore three coats for photos. Ventomarme was designed for Jen at Musings of the Wife of a Jedi's blogiversary. Happy 4th blogiversary Jen! 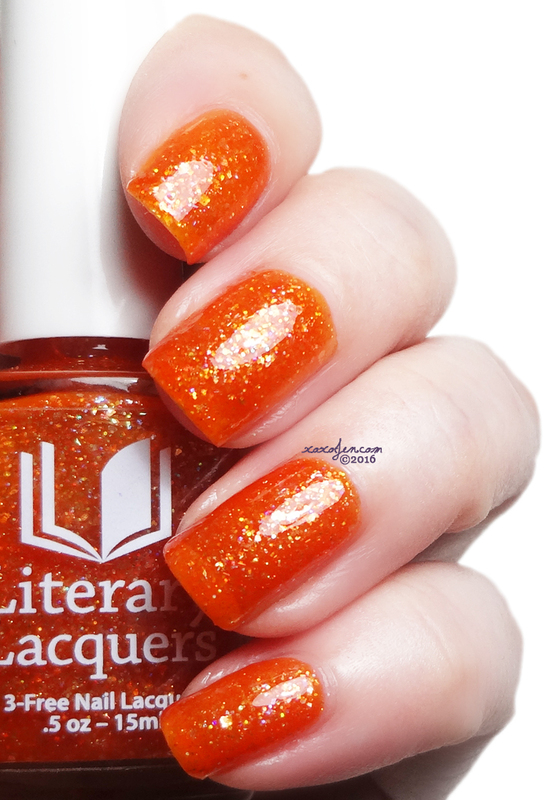 Come and Take Me – Jelly fire opal orange packed with holographic microglitter and opalescent flakies. I wore three coats and just look at that squishy jelly-ness! Amy dedicated this polish to Debbie Crumpet, she is often thought of even though she has retired from nail blogging. Debbie taught me several simple techniques that look amazing and inspired me to step outside my comfort zone with nail art. She's totally deserving of this dedication. The Book Club custom polishes were designed as part of our book club discussions in the Literary & Lacquers facebook group. Serious Nap Rays – designed with Jennifer Sky Walker inspired by Speak by Laurie Halse Anderson. Moody grey-purple-taupe with orange shimmer, pink glass fleck, purple flakies and just a touch of linear holo. Looks different in every light. My Whirlwind Other Half – designed with Jennifer Zakroff inspired by We Are All Completely Beside Ourselves by Karen Joy Fowler. 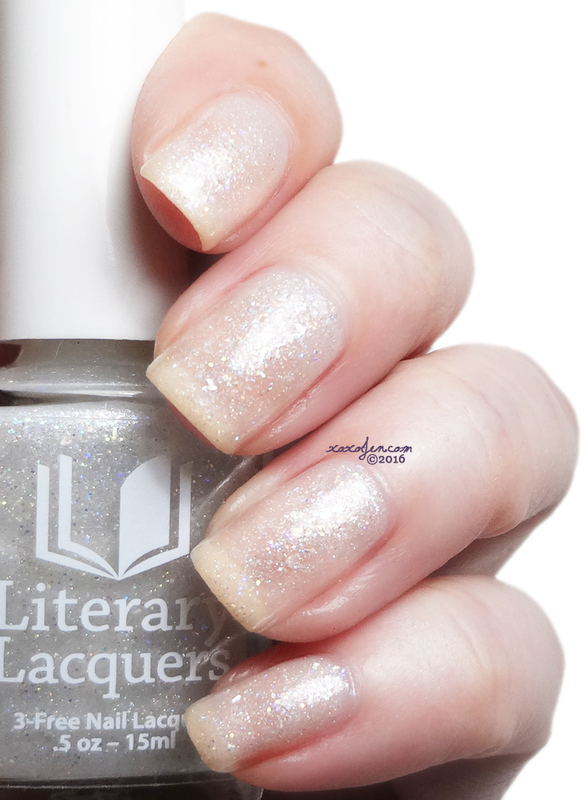 It's a sheer shimmery crelly white, packed with holographic microglitter and rainbow opalescent flakies. I wore three coats for a delicate sparkling manicure. Because it is sheer, the natural nail color comes through and causes it to look a bit like my skin color. Wearing white under it, would keep it white. It's also beautiful in one coat over other shades too, but I wanted to keep it pure for my review. All four polishes launch March 21-April 16 at the Literary Lacquers Esty shop. 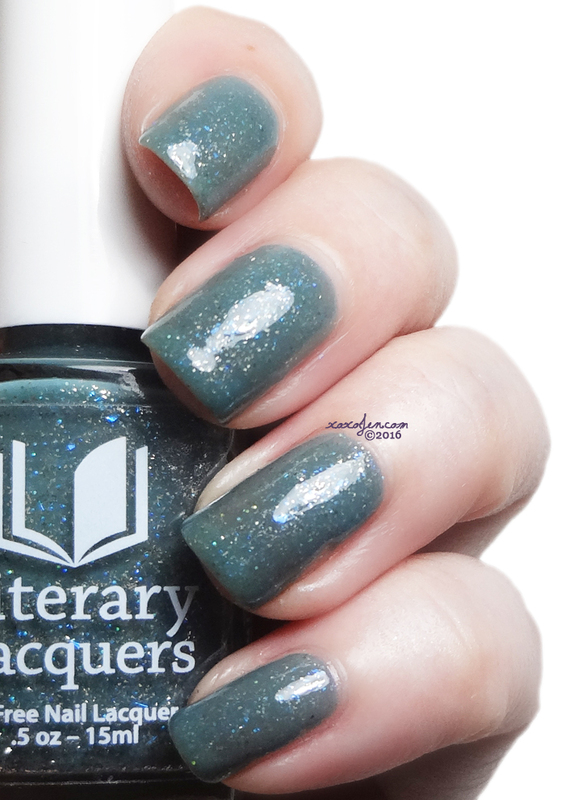 The Book Club Customs are only available to members of Literary (&) Lacquers group, so please come join us! I hope you've enjoyed my review! Some great colors here you shared. My favorite is the Ventomarme one. Thanks! It is definitely unusual! I am smitten by Serious Nap Rays! I love that purple/taupe with holo and subtle flakes! But I also like My Whirlwind Other Half! I am very drawn to those white sheers with pastel flakies and microglitter. This is a very nice collection. I also like that The Crumpet was honored with one. Miss her blogging but at least I still see some of her work in FB nail groups and all.